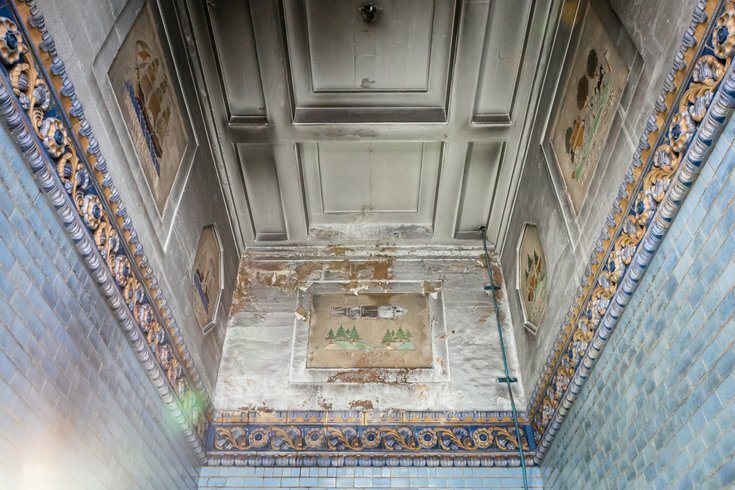 Inside the anchorages on the Benjamin Franklin Bridge, decorative tiles by Enfield Pottery and Tile Works adorn what were once designed as trolley transfer station waiting rooms for passengers. In addition to helping people traverse from Philadelphia to New Jersey across the Delaware River, the Ben Franklin Bridge has another little-known function: it's a mini-art museum, displaying sculptures, murals, colored tiles and other works. Not all can be seen by crossing the bridge, but if you drive slowly at some points, or are going across the walkway, you can view some interesting pieces. Tradition in the late 19th and early 20th centuries was that huge public works were not merely painted: they were decorated. Artists were commissioned to provide a veneer of class and culture to the steel and cement. As tastes – and budgets – changed, showcasing edifices with art has scaled back some, but a different philosophy has added new dimensions to the bridge. Inside the atrium of the One Port Center building in Camden, NJ, the headquarters of the Delaware River Port Authority, are four identical bronze statues entitled “Winged Victory” by Leon Hermant. These were originally atop flagpoles at the toll plazas on either side of the bridge. Commemorating the Ben Franklin's achievement was "Winged Victory," four gold leaf statues which represented man's triumph over nature. Created by French-born artist Leon Hermant, Winged Victory stood atop 45-foot pylons or “gateways” at the bridge, and the figures are reminiscent of the ancient Roman god Mercury, complete with wings. Some say the figures are angels. The statues were large enough for motorists to see as they approached either side of the bridge. From top of the wing to toe the figures are six feet, four inches. Each stood on a two-foot, nine-inch decorative mast cap, used to secure the statues to the pylons. When the bridge's roadway was widened in the 1940s, the pylons were removed and the statues placed in storage for nearly 50 years. 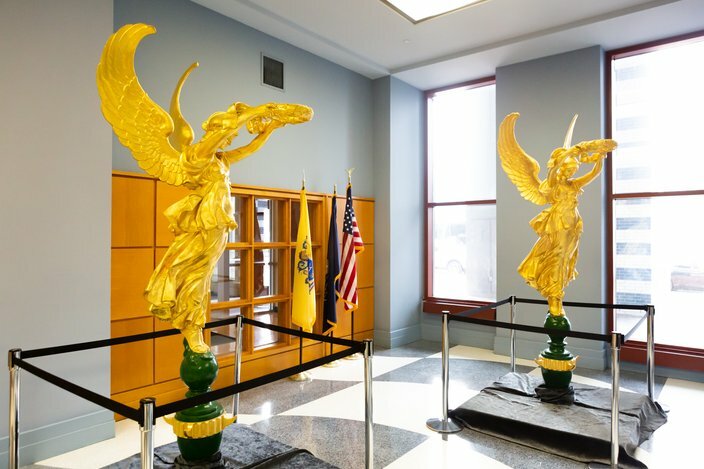 The Delaware River Port Authority had the figures restored, and they now grace the lobby of the authority's offices at 2 Riverside Drive in Camden. Each tile depicted a different form of transportation. 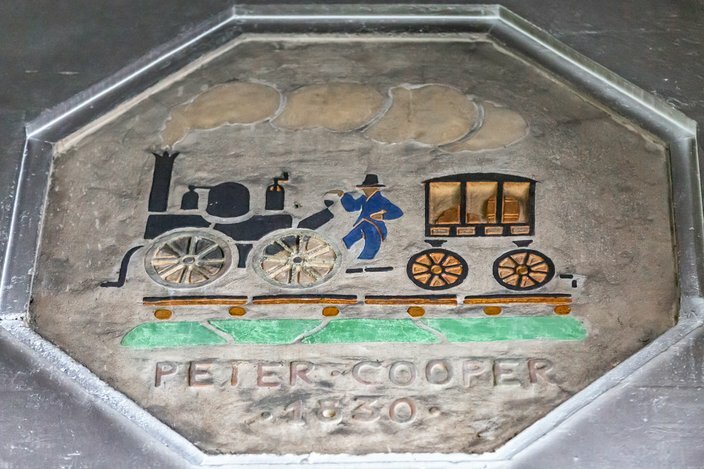 This tile featured the Flying Machine, a stagecoach from the 18th-century that could make the trip from Philadelphia to New York in only two days. 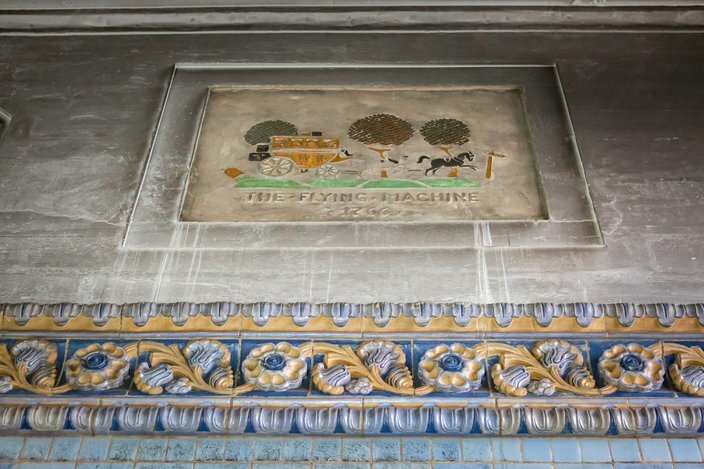 Inside the would-be waiting rooms are tile murals depicting modes of transportation, including a horse and buggy, the first American-built steam locomotive, known as the "Tom Thumb,” the USS Constitution, Columbus' Santa Maria, and a futuristic air ship. The murals were placed high on the waiting room's walls to be above the elevator doors, said Howard, so trolley passengers would have had to crane their necks to view them. The rooms have never been open to the public except when the bridge celebrated its 75th anniversary on July 1, 2001. The sculpture “Bolt of Lightning. . . A Memorial to Benjamin Franklin” (1984) by Isamu Noguchi. 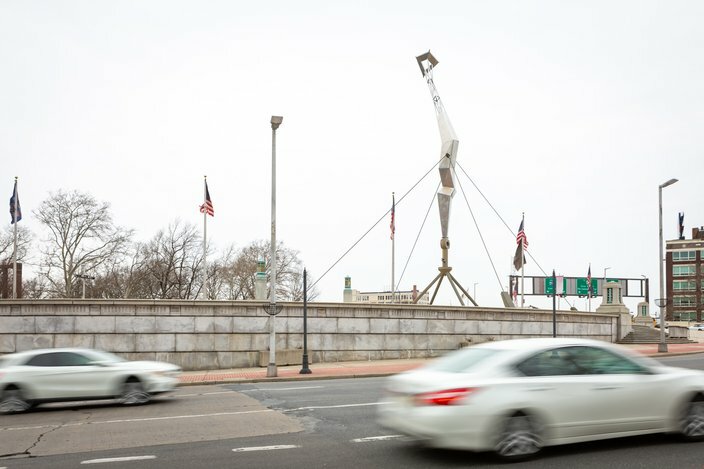 By its sheer size, the most prominent artwork is a 101-foot sculpture, "Bolt of Lightning," anchored on Monument Plaza by the bridge's Philadelphia entrance and exit ways. It commemorates Ben Franklin's kite experiment proving lighting was electricity. At its bottom is a key, at the top a kite, and in between is a silvery bolt. It had the longest journey among the bridge's artwork, taking nearly 50 years from conception to construction to dedication. Isamu Noguchi, a Japanese-American artist, produced a handful of study models for a Philadelphia monument to Ben Franklin in 1934 with variations on the stylized lightning bolt, kite and key forms. In a catalog from the Noguchi Museum at Long Island City, NY, the artist shared that he included a model in an exhibition at a Philadelphia gallery in 1934. His proposal resurfaced in 1979, and he was commissioned by the Association for Public Art to make the sculpture as a present to Philadelphia on its tricentennial in 1982. (The statue was completed and installed in 1984.) Noguchi chose the sculpture's site near the bridge. Artwork by elementary school students on the pedestrian tunnel on the Camden, NJ, side of the Benjamin Franklin Bridge. Other artworks have had an easier time finding their way to the structure. 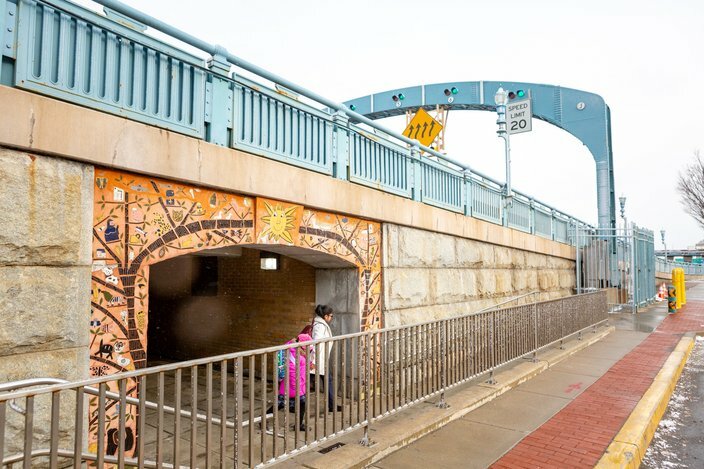 About 10 years ago, entranceways for a pedestrian tunnel under 5th Street in Camden were decorated with colorful tiles of lions, bees and other animals and insects made by elementary school students. More intricate, but no less heartfelt than the tiles, are several murals painted on additions in the bridge's infrastructure. The construction of I-676 provided several walls along exit and entrance ramps and a vehicular tunnel. Last November, the interiors of the Camden pedestrian tunnel and the vehicular tunnel at 5th and Race Streets in Philadelphia had new murals unveiled. They were created in partnership with Mural Arts Philadelphia, and painted by local artists Brad Carney, Melissa Mandel and Mat Tomeszko. Carney and Mandel collaborated on the pedestrian walkway, which features Independence Hall and sailboats underneath the bridge on a summer day among its images. A panoramic photo of the mural, “Building Connections Through Time,” by artists Brad Carney and Melissa Mandel in the pedestrian tunnel on Fifth Street below the Benjamin Franklin Bridge. For the vehicular tunnel, Tomezsko's mural in part pays tribute to the workmen who built the bridge. It also features images of the PATCO speedline, Benjamin Franklin (actually Franklin impersonator Ralph Archibald), and Winged Victory. Across from Monument Plaza, on walls of an exit ramp for I-676 and underneath an overpass, is a two-part mural, 'City in Retrospect,' by James Radar. The first part shows how a city skyline might have looked in the late 19th century. Part two depicts a street scene from that era, with horse-drawn carriages, gas street lamps, men in top hats and women in long dresses. The tiles were made by Enfield Pottery and Tile Works, located in Springfield Township, Montgomery County, Pennsylvania from 1906-1930. 'City in Retrospect' seems a fitting title in this regard: artwork at the Ben Franklin Bridge encompasses images from several centuries, from Franklin's colonial era, to 19th century horse and buggies, to man's triumph over nature by building the world's longest suspension bridge (for a time) in the 20th century, to the aesthetic enhancement of modern roadways and tunnels in the 21st Century. The Ben Franklin Bridge does help people travel from Pennsylvania to New Jersey, but it also represents an artistic as well as an engineering achievement.